Anyone with any experience of modifying the Korg MS20 Kit -- the full-size keyboard version rather than the desktop MS20M variant or the mini? I've scoured the interweb and have found some useful stuff, but some of it seems rather vague and optimistic rather than solid, so I was looking for any thoughts from anyone with direct personal experience. 1. add options to route the LFO (MG) or EG2 to control the Osc1's PWM, either via switches or an extra patch socket. 5. Bring out some of Osc1's waveforms to patch sockets. Basically you're looking for the top of the existing pulse width rotary control. so that should be easy to track down. As soon as you plug in a CV signal from for example the LFO or Envelope output to this new socket, the existing pulse width control becomes the PWM level. 3. Not sure about this one, as my mini doesn't have both filters, but as far as I know you just need to bring out the connections from that red jumper at mid top of your kit circuit board (see my first photo above, just to the right of the multiway connector) to a front panel switch. 5. Easy peasy - just add extra jack sockets to the three appropriate poles on your existing VCO1 waveform switch. Again, this is the MS20 original schematic, but finding the equivalent points on your kit should be easy. Yes. Not surprisingly, Korg are reluctant top release schematics of current products -- as most manufacturers are. It's a trap! I've had a close look, and many of those silk screenings are misleading and don't do what they suggest because linking components are missing from the other side of the board! The PWM input markings are amongst the few that do appear workable, although I've not checked it in practice yet. As soon as you plug in a CV signal from for example the LFO or Envelope output to this new socket, the existing pulse width control becomes the PWM level. Yes, that's neat -- although I was thinking of omitting the socket and going for switch-selectable manual, LFO or EG2 options. Don't think I'd ever need more than that, and extra switches are a lot easier to install on the front panel than extra sockets! Hmmm... bit unsure of this. The photo seems to show a connection between transistor bases -- I'm not convinced he applied the extra routing diode... will need some careful experimentation there. 3. Not sure about this one, as my mini doesn't have both filters. That one's the easiest of the lot, as the MS20 Kit already brings out the options to a header with a link plug. Yes, I just need to track down the right end of the equivalent of D22. Its helpful to know that you've managed similar mods to the Mini, and that the thinking is broadly right. It's the practical implementation that represents the challenge now... but that's all part of the fun! Hugh Robjohns wrote: It's a trap! I've had a close look, and many of those silk screenings are misleading and don't do what they suggest because linking components are missing from the other side of the board! The PWM input markings are amongst the few that do appear workable, although I've not checked it in practice yet. Hugh Robjohns wrote: Yes, that's neat -- although I was thinking of omitting the socket and going for switch-selectable manual, LFO or EG2 options. Don't think I'd ever need more than that, and extra switches are a lot easier to install on the front panel than extra sockets! Hugh Robjohns wrote: Hmmm... bit unsure of this. The photo seems to show a connection between transistor bases -- I'm not convinced he applied the extra routing diode... will need some careful experimentation there. It worked for me - it's actually connecting the collector of the VCO1 transistor to the base of the VCO2 transistor via the diode, thus forcing VCO2 waveform to reset each time VCO1 output goes high. Hugh Robjohns wrote: Its helpful to know that you've managed similar mods to the Mini, and that the thinking is broadly right. It's the practical implementation that represents the challenge now... but that's all part of the fun! Indeed - the very best of luck! Martin Walker wrote: Doh!! wasn't expecting that! Quite -- and it seems to have thrown a few others if other interweb forums are to be believed! it's actually connecting the collector of the VCO1 transistor to the base of the VCO2 transistor via the diode, thus forcing VCO2 waveform to reset each time VCO1 output goes high. Yes, I can see how it's supposed to work. I'm just not convinced that the photo shows those exact connection points. I have a sneaking suspicion that the picture shows the VCO1 wire leaving from the junction of the two transistor bases and the diode's cathode. Maybe it still works that way! I'll report back if/when I succeed! Hugh Robjohns wrote: Yes, I can see how it's supposed to work. I'm just not convinced that the photo shows those exact connection points. Okay... Happy now! I've worked it through... The wires shown in the pic connect the collector of Q3 in the MS20-kit (shown as Q4 in the original schematics) to the collector/base of Q17 (shown as Q11 in the original docs)... which is as the unofficial mod shows it. The extra routing diode is presumably on the switch. Your waste disposal unit playing up again? Have Korg added the ability to be able to modulate each oscillator separately on the latest versions? Because that certainly wasn't possible on the original MS20 which IMO doesn't make adding oscillator sync very useful. BigRedX wrote: Have Korg added the ability to be able to modulate each oscillator separately on the latest versions? Because that certainly wasn't possible on the original MS20 which IMO doesn't make adding oscillator sync very useful. On the ms20m desktop model, yes... But not the mini or the ms20 kit. SOS wrote: When you activate FM, several things happen. Firstly, VCO1 becomes a frequency-modulation source for VCO2, the amount set by the ‘MG/T.Ext’ knob. Secondly, the VCO pitch component of the ‘Total’ input jack is disconnected, denying at a cruel stroke the opportunity for voltage-controlled FM intensity. Thirdly, and significantly for oscillator sync, the ‘EG1/Ext’ amount knob now points exclusively at VCO2. In other words, only with FM active can you enjoy envelope-swept sync. A little later I discovered that it is possible to access VCO2’s frequency in (almost) isolation, despite the loss of the dedicated CV input. It’s not clear from the manual, but when FM is active, the ‘Freq’ input (which ordinarily affects both VCOs) only affects VCO2. Now you can pipe in an LFO or other modulation source without disturbing the pitch of VCO1, although CV received at the main input still drives both in parallel. Why do you want to do all this H? After all, it's just an MS 20. It's not just an MS20, it's an M&S MS20. Zukan wrote: Why do you want to do all this H? After all, it's just an MS 20. I had a hankering to play again with a simple monosynth, away from the computer screen. Nostalgia! I've owned various over the years, but mostly Rolands of various sorts; I've never had a Korg, and the opportunity arose... but there are few things that I'd like to do but which the Korg doesn't support directly. That sync mod, is it applicable to other synths ? Depends on the oscillator circuitry. The Korg makes it easier than many because the oscillators are built from discrete circuitry, so getting into the innards to force a cycle reset isn't too hard. That may not be the case with other designs. 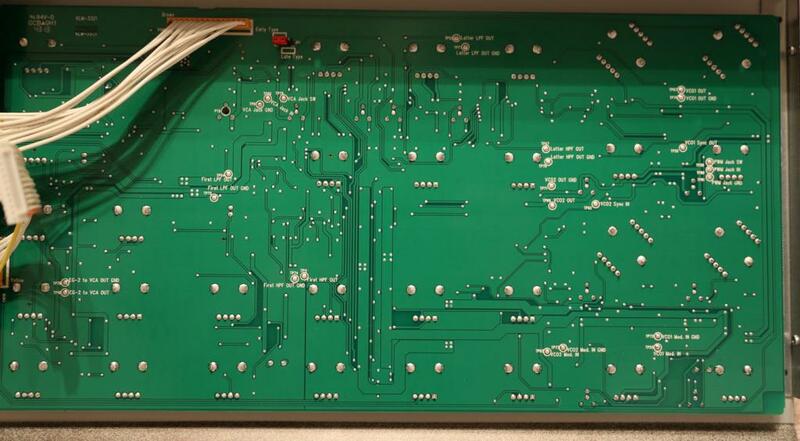 Pics on the web showing its innards all look pretty discrete to me, though spread over multiple smaller boards. That's far more useful then. It's a pity these features weren't on the original MS20. Once I'd got over the novelty of the patch bay and leads, it quickly because apparent that without other equipment to connect to it, there wasn't really anything anything it could do that any other 2 oscillator, 2 envelope generator synth of that time could do also (and probably more easily since the routing would have been done with switches rather than patch leads). Go for it! Great fun modding simple gear into tasty muthas. Ask Martin. I found the older synths easier to work with. I modded my Arp Solus but only with basic stuff as I'm not handy with soldering anymore and I am not a Jedi like Martin or Will. I also modded my SH3a with a pitch wheel and got James Walker to get it to do a couple of other insane things but can't remember what they were.